Reigning champions Munster will start their RaboDirect Pro12 campaign against the Dragons at Musgrave Park on the weekend of September 2. 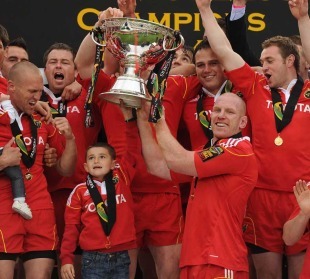 Munster took last season's Magners League title, beating perennial rivals Leinster 19-9 in the final, and the runners-up will open their campaign at the Liberty Stadium against the Ospreys. Other clashes on the opening weekend include Heineken Cup Pool 2 sides Edinburgh and Cardiff Blues meeting at Murrayfield, Treviso hosting Connacht, Glasgow Warriors travelling to Ravenhill to face Ulster and the Scarlets taking on Aironi at Parc y Scarlets. The competition will continue during the Rugby World Cup, but there is a two-week hiatus planned after round six. Prior to the first round of Heineken Cup fixtures there are three major derbies - Leinster host Munster in Dublin, the Dragons face Cardiff Blues at their Rodney Parade home and the Ospreys host the Scarlets. After just two rounds of games during the 2012 Six Nations, the play-offs will take place on the weekend of May 11, with the final two weeks later on May 26.